About two and a half blocks from my apartment is a foot bridge over the FDR Drive to the East River Esplanade. I often go there to jog in the morning or to read my book on a nice Spring/Summer evening. One thing that I’ve noticed while walking this footbridge is that it can be quite dangerous. The cars of the FDR are many feet safely below the bridge, so that’s not the danger. Even though the bridge is on the same street as an entrance/exit to the drive, most of the cars do not turn on to or from York, so that’s not the danger. It’s not a haven for homeless or drug dealers, so that’s not the danger. People who walk their dogs near the bridge are conscientious of the other people around, so they are not the danger. No, the danger is much more subtle. To the left of the footbridge is Rockefeller University. On the other side of the street are other buildings associated with Rockefeller University. 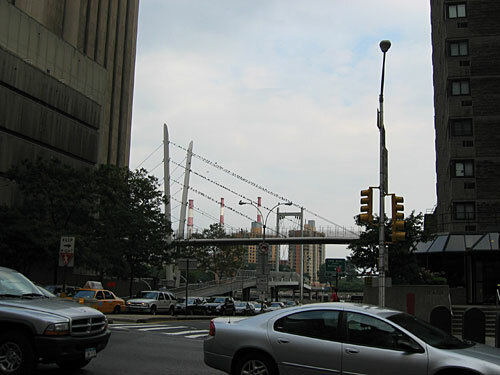 Within the last five years or so, Rockefeller University built a footbridge of their own that transverses 63rd Street at the equivalent of about the second floor. I must say, from an aesthetics standpoint, it’s quite nice. It’s a single footpath three-quarters of the way from the South side of 63rd Street to the North, at which point it forks into two narrower paths; one that leads to the connected building, the other that seems to be used only for ductwork. At the point that it forks, there are two towers that jut straight up from the ground and then bend outwards away from the bridge at the point that they intersect the footpath. I don’t know exactly what the term for that type of bridge is, but it looks like a cable stay bridge except that it has two towers from which the cables emanate as opposed to the one tower that I am used to seeing. It is on these cables that the danger lurks. Lurks and awaits an unsuspecting victim to fall into their trap. 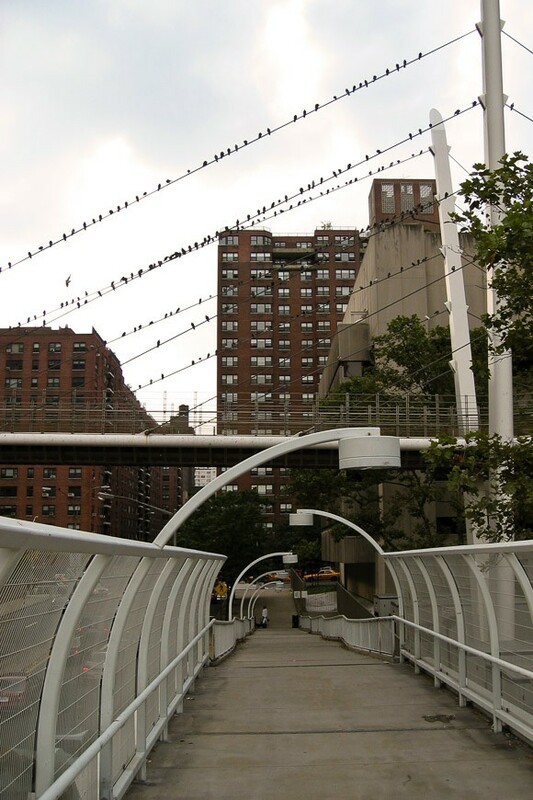 View of the Rockefeller University footbridge from York Ave.
Pigeons. Rock Doves. Rats with wings. 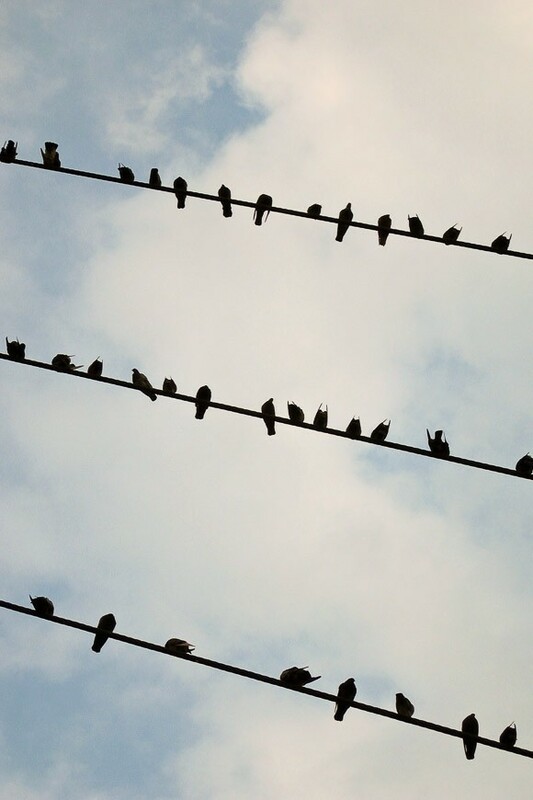 Whatever you want to call them, at any time, there are easily between 50 and 100 of them sitting on the wires of the bridge. Because both footbridges run tangential to each other and the wires of the University bridge are right above the lower footbridge and are angled away from the walkway of the upper bridge, walking the lower footbridge without getting hit by falling, repulsive, pigeon poop can be a bit of a challenge. 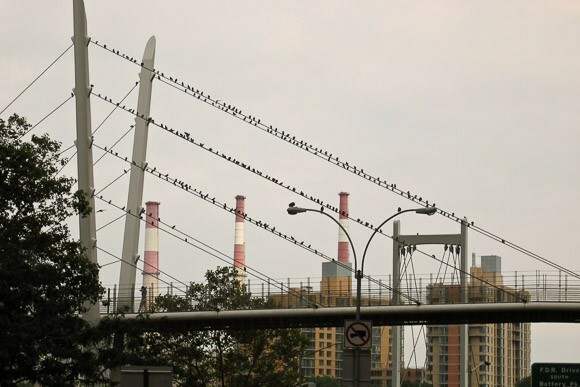 It is as if an Alfred Hitchcock movie was amassing on the Upper East Side, and waiting for word that it’s time to attack and pay humanity back for constantly aggravating them. Perhaps the pigeon that attacked me in my apartment was a scout sent out to test how humans would react when being attacked (see The Rock Dove). When you walk the footbridge to the esplanade, it is nice and clean except for two patches, each about 3 feet wide. These two patches correspond to the location of each side of the University bridge, right below the wires that hold the bridge up. It is riddled with rock dove litter. 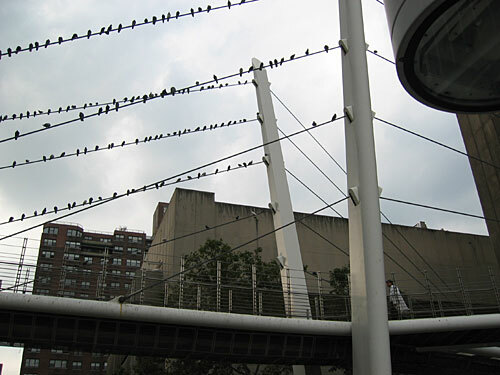 Pigeons on the wires of the Rockefeller University bridge. While I myself have not been hit by any plunging pigeon poop, I have seen more than a few people get pummeled with it. It takes a deft, skilled walker to recognize that you must speed up through the danger zones in order to avoid the inevitable splat. 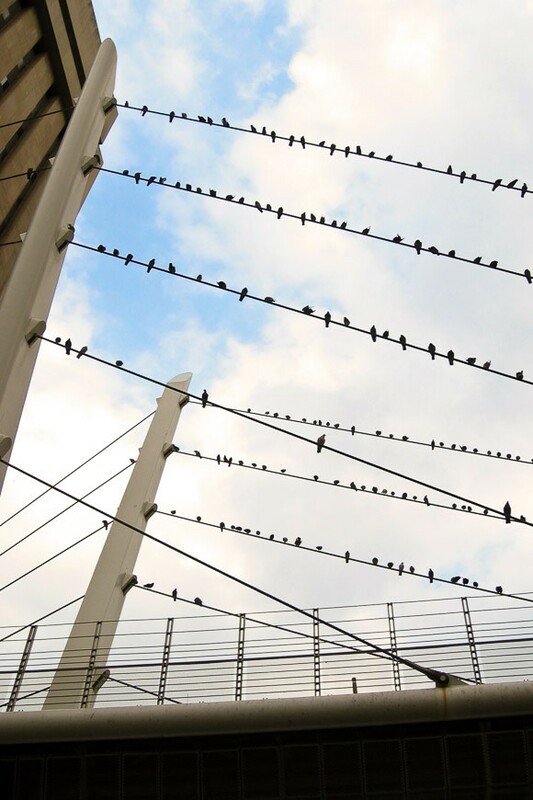 One thing that I do find quite interesting is that the pigeons only seem to inhabit the wires on one side of the wire towers. Perchance it is because the angle on the other side of the towers is greater? Or maybe it’s because no humans walk under the wires on the other side, and it wouldn’t be as much fun to sit there? This has been a problem ever since the bridge was built, and I don’t expect the esplanade bridge to become safer any time soon. Perhaps a letter to the president of Rockefeller University is in order?